The Un-Official Blog of Romance Author Maddie James: What To Do With Leftover Bread and Mulled Cider? Bread Pudding! What To Do With Leftover Bread and Mulled Cider? Bread Pudding! For several years, I've had this thing with bread pudding. Maybe it is because I did not discover bread pudding until I was an adult and I had some at the fabulous Seelbach Hotel in Louisville, KY. This dish, I tell you, is to die for. The bread pudding is fabulous and the bourbon sauce they pour over it even more so. I've heard, and I cannot tell you from where, that the chefs at the Seelbach use whatever bread is left from the day before--croissants, muffins, rolls, etc.--to make their daily batch of pudding. I find that very interesting and quite resourceful! So from time to time in my travels, I'll visit a restaurant and bread pudding is on the dessert menu. I'll try it and well, even though it might be good, it's not the Seelbach's bread pudding. 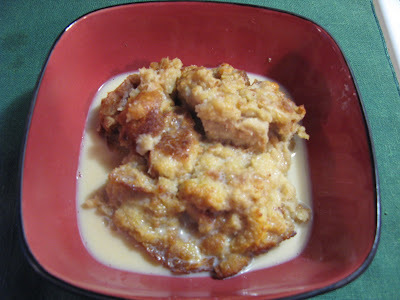 I believe bread pudding is a southern thing. Perhaps, since I grew up north of the Mason Dixon, this is why I'd never experienced as a child or young adult. Now, living in the south (sorta) I see and hear of it more often. 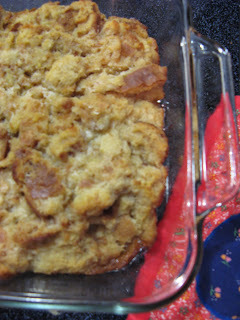 I never thought about making bread pudding, that is, until yesterday. I could have searched for a recipe, but didn't. You see, even though I've never made bread pudding, I've made something similar for years -- my turkey dressing. I know, I know... entirely different, right? Well, perhaps the ingredients are different but the preparation method, I believe, is very similar. And seeing that I had some leftover ingredients to use up before I went out of town for a couple of days, I decided, well, heck, let's try our hand at bread pudding. Here is how I made it, using ingredients I already had on hand. And last, I poured over some spiced/mulled cider (also leftover and I had been wondering what to do with besides drink) I poured a little of the cider over at a time while folding and stirring into the bread. I didn't want the mixture to be too wet or too dry, so gauge the addition of your liquids carefully. You don't want runny but you do want moist. Now, I could have added all sorts of stuff at this time, like raisins or other dried fruit, or different spices, or even chocolate chips or caramel, depending on the mood. (kind of like adding mushrooms or celery or onions or sage or chopped up giblets to your dressing). I didn't add any spices because the cider was very spicy already. Last, I poured the mixture into the buttered pan and dotted it with several pats of butter on top, then baked at 400 degrees until the pudding was set and the top a bit crispy. For a sauce, I used more of the eggnog spiked with the mulled cider and heated it in a saucepan. I poured that over the hot pudding in each dish. All I can say is, YUM. The only thing better could have been a little Woodford Reserve in the sauce... Or an actual visit to the Oak Room at the Seelbach. Maybe next time on the bourbon. I have to drive later today. Yum! Sounds fantastic. I think Bread Pudding is one of those things that's either really good or really "not". I've heard that Mariah's in Bowling Green has excellent Bread Pudding, though I can't say I've had it myself. Maybe I'll try your recipe! How can you go wrong with bread, sugar, eggs, and cider?